Celebrity fashion moment. Lily James, star of the new Cinderella film opening this month, appears in the March 2015 issue of InStyle magazine wearing Look 28 from Vera Wang's Spring 2015 Collection. The blush floral print silk gauze gown has pleated and ruched tiers, and is worn with an aquamarine floral print gauze slip with back pleated godet. “White Heat” by Melissa Rubini; photographed by Horst Diekgerdes. Below is fashion model wearing the dress on the runway. Lily Chloe Ninette Thomson (born 5 April 1989), better known by her stage name Lily James, is an English actress. She is best known for her role as Lady Rose MacClare in the period drama Downton Abbey. She has been cast to star in the title role of the 2015 Disney film Cinderella. 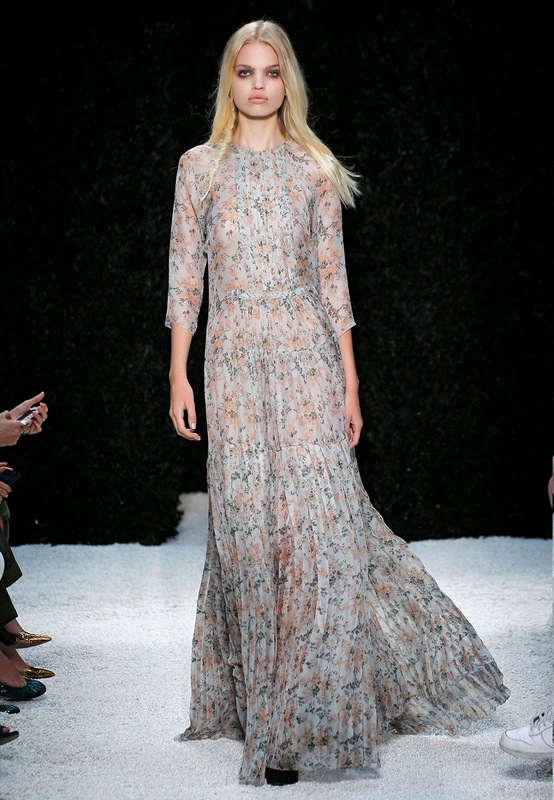 You may also have interest in viewing our Vera Wang Spring 2015 Ready to Wear blog post.